Coach Dana Altman has done it again. Despite losing eight players last spring, Oregon has enough talent to win 23-24 games and enough talent that they should be a Sweet Sixteen contender. Yes, it is amazing. 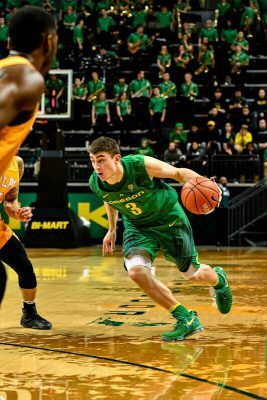 The Oregon roster includes Payton Pritchard, Keith Smith, Roman Sorkin and players you wouldn’t recognize if you stood next to them in the EMU. Here’s a quick rundown of Oregon’s new roster as we approach the October 30th opener. Oregon’s offense will start the year flowing through Pritchard, but by the time the conference starts, look for it to also run through Troy Brown and Elijah Brown. All of them are capable of starting the offense, running it from the point or the wing and getting their teammates involved. Based on their talent, I think those three are almost locks to be starters. However, the other two starting spots and the rotation behind them are open, and playing time will be based on whomever plays the best defense. Everyone on Oregon’s roster can score the basketball, and everyone is a pretty good passer. But who plays defense will determine who plays. 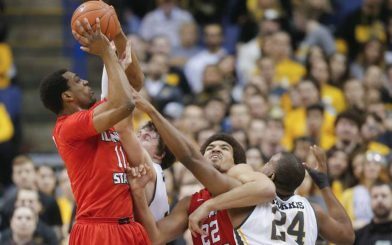 The match-up zone is built for everyone on this roster for one reason or another: their quickness on the perimeter, their length to close out on shooters, or their size and ability to contest in help defense situations. Whoever is doing that best is who you’ll see on the court, especially until conference play begins. Pritchard will be asked to create looks for teammates all year. The defense will be a serious work in progress. With no Jordan Bell, Chris Boucher or Kavell Bigby-Williams on the back line to erase mistakes, they’ll have to play defense with their feet and rebound as a group. Pritchard returns, and he’s the unquestioned starter at the point. He’ll have to resist his tendency to create for himself before creating for others, but his game grew plenty last year, and he has all kinds of reasons to look for teammates again this year. Smith scored Oregon’s final basket last April when he laid it in late against North Carolina, and it looks like he’s gained some muscle. Like Pritchard, he has tremendous work ethic. Most good college players enjoy their biggest jump in productivity in their sophomore year. That’s likely to happen for Smith as well. He can shoot it, pass it, and with his length and athleticism, he was very disruptive at the top of Oregon’s zone press defense. Look for him at the top of the press again this year. His experience in Altman’s defense will be key to helping his teammates as they all learn how to mesh the defense together. Smith should contend for a starting spot and play about 25-27 minutes whether he starts or not. Sorkin could start early in the year, primarily because of his knowledge of the defense and the fact that they need big bodies on the floor to match up against certain teams (especially in the PK 80 Tournament in November). He’s not a great one-on-one defender but does well in the matchup zone where he can find someone to put a body on and use his length to disrupt passes in the lane. Troy Brown can play 3-4 spots at both ends of the floor. Mr. Everything Troy Brown Jr. Troy Brown is the best high school player Altman has ever landed at Oregon. A five-star player, McDonald’s All-American, and a guy who can play up to four spots for the Ducks this year. Brown played point guard in high school, but he’ll start right away for Oregon at a wing spot. His versatility enabled Altman to recruit the best players he could find, regardless of position – he knew if he didn’t land a great off guard, small wing player, or big wing (power forward), Brown could play any of those spots. Watch this dunk at the 5:38 mark of this video. It’s over the nation’s number one center, Marvin Bagley Jr. When Oregon goes big, Brown may play some point. When the Ducks go small, he might play the equivalent of the NBA power forward spot. He’s that versatile. Brown is also a tenacious defender, and his ability to rebound and lead the break himself could make it easy for Paul White, Kenny Wooten and Elijah Brown to get some easy buckets in the transition game. Everyone get out on the break and fill a lane! 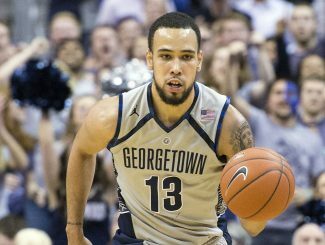 Paul White practiced and spent the year with last year’s team after transferring after he suffered an abdominal injury at Georgetown. 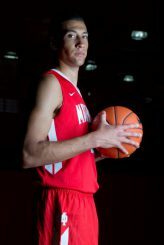 A top-50 player out of high school, he was a teammate of Philadelphia 76’er Jahil Okafor at Whitney Young in Chicago. White looks completely healed from the injury, and his all-around game makes him a contender to start right away. 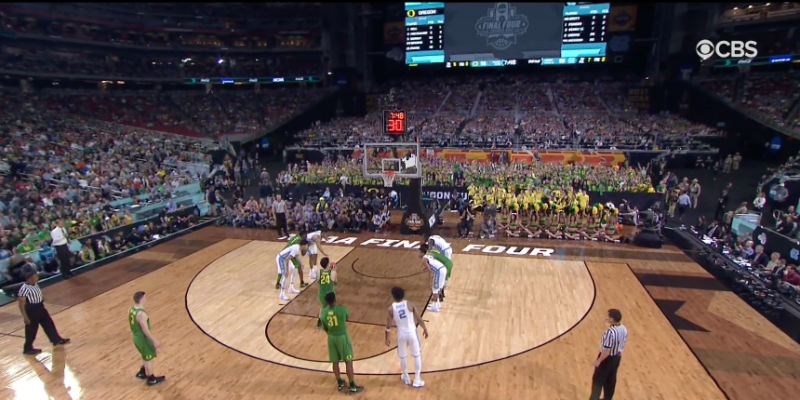 Paul White brings an all-around game and length to the Oregon D.
White brings a good mid-range jumper, excellent passing and ball-handling skills, and the ability to take his guy off the dribble. His length and quickness of his feet as a rim protector is something Oregon needs. If he wasn’t so broad-shouldered and strong you’d swear ex-Duck Mike Moser had grown 3 inches and was back out there. Same kind of player — not as much shooting range, but a lot of the same skills. NBA Players’ Sons. Two of Them. Elijah Brown is the son of Golden State Warrior assistant coach Mike Brown. A 5th-year transfer and a lefthander, Brown averaged almost 19 ppg last year at New Mexico. He fits well defensively with his toughness out front as well as his ability to finish on the break and shoot it coming off screens. He’ll benefit tremendously playing alongside both Pritchard and Troy Brown. As those two put it on the deck and get into the lane, Elijah should have open mid-range and 3-point jumpers. MJ Cage should compete for 20-25 minutes a game. Expect MJ Cage to push past Sorkin this year and move ahead of him in the rotation. The Ducks don’t have guys like Cage on their roster. He’s big, wide and able to dominate for stretches on the glass. If Sorkin shoots it well it could minimize Cage’s playing time, but the Ducks need his size and toughness on the boards. Cage, like Brown, is the son of a former NBA player. Cage’s father Michael was a rebounding machine. His body is built similarly, and he’s shown he’s capable of being that kind of player. 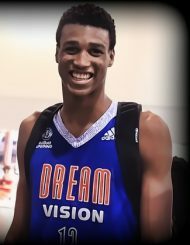 Wooten brings tenacity, length and athleticism to the Oregon D.
Kenny Wooten is one of those physical specimens that Altman’s been recruiting lately. At first his game looks raw, and then you see him grabbing loose balls, putting it back in, and getting the foul. You see him rebounding with some ferocity and scoring on the block. Oregon doesn’t have a lot of guys who can score on the block, and Wooten could find his niche on this team. He shows he can be consistent doing that early. Wooten’s challenge is that he’s 6′ 9″ but only 200 lbs. That’s the same weight as Pritchard. He’ll put 20 lbs on in the next two years, and when he does he could be a beast. And if MiKyle McIntosh hadn’t signed late, you might have seen him a lot more on the court. As it stands, he might just redshirt this year. I doubt it, but Oregon’s loaded with guys up front, and he or Kigab could be the guy to watch this season instead of wasting a year without much playing time. Victor Bailey Jr., an Austin, Texas native, is likely to get some time as a backup to Pritchard and Brown. He’s a combo guard who can play either spot. He’s maybe the most athletic player on the whole roster — quick, strong, and a huge leaper and finisher. If he learns Altman’s defense quickly he could earn more playing time. He has the foot quickness to challenge point guards in the Pac-12. That alone could put him on the court at times when Altman wants to give either Pritchard or Brown a break. McIntosh has the body to punish opponents between the foul line and the rim. MiKyle McIntosh was a great late addition to this roster. He’s a grown man for sure. Over 230 lbs at 6’7″, he might remind you physically of Elgin Cook. He can score it, he can defend, and he’s not going to get pushed around on the block, either. Another 5th-year transfer and another Canadian, McIntosh has a nice soft touch on the elbow jumper on the pick and roll, and he seems to dunk everything he can get his hands on. He’s another guy whose playing time is really only limited by how fast he learns to play Altman’s defense. He could start or sit on the bench, depending on how quickly that happens. Like most everyone on Oregon’s roster he has really nice offensive skills. Abu Kigab is another Duck originally from Canada. Go figure huh? He looked like he’d get some decent playing time this year, and he’s a four-star talent – but then McIntosh and Wooten signed. His upside is off the charts. Another great athlete. Recruiting for the Class of ’18 has a chance to deliver the most storied class in the history of the program. Oregon’s already landed Miles Norris and five-star Louis King. The Ducks also have Bol Bol in the mix. The son of Manute Bol said Saturday he’s cut his list to just Oregon and Kentucky. He’s canceling his trip to Arizona after visiting Oregon in late September. Oregon has also hosted the nation’s number one player RJ Barrett, five-star Emmitt Williams, and four-star guards Luguentz Dort and Will Richardson. Dort has a solid relationship with fellow Canadian and current Duck Abu Kigab. Expect Oregon to land one or two from the list of Bol, Dort, Barrett and Williams.